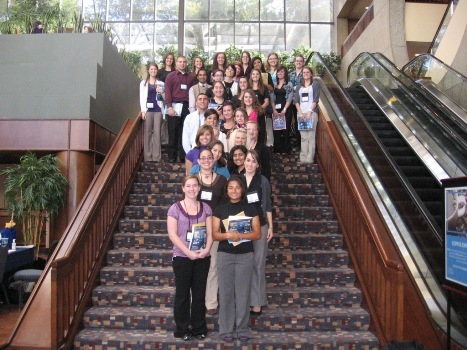 On October 14, 2010, 32 Health Science students who are members of the Student Public Health Association (SPHA) attended the national conference of the American School Health Association (ASHA). They are pictured in the Crown Center Hyatt Regency Hotel in Kansas City, MO. To attend, they raised money for bus transportation by selling purple HES t-shirts, and served as student monitors for the ASHA council luncheon workshops. While at the conference, they heard the keynote speaker, Kevin Jennings, Assistant Deputy Secretary of Education discuss bullying and harassment in his “Creating ‘Truly Safe’ Schools” presentation.